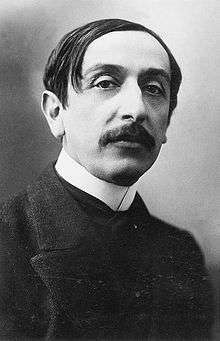 Auguste-Maurice Barrès (French: [baʁɛs]; 19 August 1862 – 4 December 1923) was a French novelist, journalist and politician. Spending some time in Italy, he became a figure in French literature with the release of his work The Cult of the Self in 1888. In politics, he was first elected to the Chamber of Deputies in 1889 as a Boulangist and would play a prominent political role for the rest of his life. Barrès was associated in his literary works with Symbolism, a movement which had equivalence with British Aestheticism and Italian Decadentism, indeed he was a close associate of Gabriele d'Annunzio representing the latter. As the name of his trilogy suggests, his works glorified a humanistic love of the self and he also flirted with occult mysticisms in his youth. The Dreyfus affair saw an ideological shift and he was a leading anti-Dreyfusard, popularising the term nationalisme to describe his views. He stood on a platform of "Nationalism, Protectionism and Socialism." Politically, he became involved with various groups such as the Ligue des Patriotes of Paul Déroulède, which he became the leader of in 1914. Barrès was close to Charles Maurras founder of Action Française, a monarchist party. 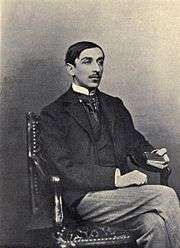 Despite the fact that he remained a republican, Barrès would have a strong influence on various following French monarchists, as well as various other figures. During the First World War, he was a strong supporter of the Union Sacrée. In later life, Barrès returned to the Catholic faith and was involved in a campaign to restore French church buildings and helped establish 24 June as a national day of remembrance for St. Joan of Arc. Portrait of a young Maurice Barrès. Les Déracinés, published in 1897. Born at Charmes, Vosges, he received his secondary education at the lycée of Nancy, and in 1883 continued his legal studies in Paris. Establishing himself at first in the Quartier Latin, he became acquainted with Leconte de Lisle's cenacle and with the symbolists in the 1880s, even meeting Victor Hugo once. He had already started contributing to the monthly periodical, Jeune France (Young France), and he now issued a periodical of his own, Les Taches d'encre, which survived for only a few months. After four years of journalism he settled in Italy, where he wrote Sous l'œil des barbares (1888), the first volume of a trilogie du moi (also called Le Culte du moi or The Cult of the Self), completed by Un Homme libre (1889), and Le Jardin de Bérénice (1891). The Cult of the Self trilogy was influenced by Romanticism, and also made an apology of the pleasure of the senses. He supplemented these apologies for his narcissism with L'Ennemi des lois (1892), and with an admirable volume of impressions of travel, Du sang, de la volupté, de la mort (1893). Barrès wrote his early books in an elaborate and often very obscure style. The Comédie Française produced his play Une Journée parlementaire in 1894. A year after establishing himself in Neuilly, he began his trilogy in 1897, Le Roman de l'énergie nationale (Novel of the National Energy), with the publication of Les Déracinés. In this second major trilogy, he superated his early individualism with a patriotic fidelity to the fatherland and an organicist conception of the nation (see below for details). Affected by the Dreyfus Affair, and finding himself on the side of the Anti-Dreyfusards, Barrès played a leading role alongside Charles Maurras, which initiated his shift to the political right; Barrès oriented himself towards a lyrical form of nationalism, founded on the cult of the earth and the dead ("la terre et les morts", "earth and the dead" — see below for details). Le Voyage de Sparte (1906). He presented himself in 1905 to the Académie française, but was supplanted by Etienne Lamy. He then tried again, but inclined himself before the candidacy of the former Minister Alexandre Ribot. But he was finally elected the next year, gaining 25 voices against 8 to Edmond Hauraucourt and one to Jean Aicart on 25 January 1906. Barrès was also a friend since his youth of the occultist Stanislas de Guaita, and was attracted by Asia, sufism and shi'ism. But he returned in his later years to the Catholic faith, engaging in L'Echo de Paris a campaign in favour of the restoration of the churches of France. His son Philippe Barrès followed him in a journalism career. As a young man, Barrès carried his Romantic and individualist theory of the Ego into politics as an ardent partisan of General Boulanger, locating himself in the more populist side of the heterogenous Boulangist coalition. He directed a Boulangist paper at Nancy, and was elected deputy in 1889, at the age of 27, under a platform of "Nationalism, Protectionism, and Socialism", retaining his seat in the legislature until 1893, when he was defeated under the etiquette of "National Republican and Socialist" (Républicain nationaliste et socialiste). From 1889, Barrès' activism overshadowed his literary activities, although he tried to maintain both. He shifted however to the right-wing during the Dreyfus Affair, becoming a leading mouthpiece, alongside Charles Maurras, of the Anti-Dreyfusard side. The Socialist leader Léon Blum tried to convince him to join the Dreyfusards, but Barrès refused and wrote several antisemitic pamphlets. He wrote, "That Dreyfus is guilty, I deduce not from the facts themselves, but from his race." Barrès' anti-Jewishness found its roots both in the scientific racial contemporary theories and on Biblical exegesis. He founded the short-lived review La Cocarde (The Cockade) in 1894 (September 1894 – March 1895) to defend his ideas, attempting to bridge the gap between the far-left and the far-right. The Cocarde, nationalist, anti-parliamentarist and anti-foreign, included a diverse collection of contributors from a wide variety of backgrounds (monarchists, socialists, anarchists, Jews, Protestants), including Frédéric Amouretti, Charles Maurras, René Boylesve and Fernand Pelloutier. He was again beaten during the 1896 elections in Neuilly, as a candidate of the Socialist leader Jean Jaurès, and then again in 1897 as a nationalist antisemitic candidate, having broken with the left-wing during the Dreyfus Affair. Barrès then assumed the leadership of the Ligue de la Patrie française (League of the French Fatherland), before taking membership in the Ligue des Patriotes (Patriot League) of Paul Déroulède. In 1914, he became the leader of the Patriot League. Close to the nationalist writer Charles Maurras, founder of the monarchist Action française movement, Barrès refused however to endorse monarchist ideas, although he demonstrated sympathy throughout his life for the Action française. Most of the later monarchist theorists (Jacques Bainville, Henri Vaugeois, Léon Daudet, Henri Massis, Jacques Maritain, Georges Bernanos, Thierry Maulnier...) have recognised their debt toward Barrès, who also inspired several generations of writers (among which Montherlant, Malraux, Mauriac and Aragon). Barrès was elected deputy of the Seine in 1906, and retained his seat until his death. He sieged at that time among the Entente républicaine démocratique conservative party. In 1908, he opposed in Parliament his friend and political opponent Jean Jaurès, refusing the Socialist leader's will to Pantheonize the writer Émile Zola. Despite his political views, he was one of the first to show his respect to Jaurès' remains after his assassination on the eve of World War I. During World War I, Barrès was one of the proponents of the Union sacrée, which earned him the nickname "nightingale of bloodshed" ("rossignol des carnages"). The Canard enchaîné satirical newspaper called him the "chief of the brainwashers' tribe" ("chef de la tribu des bourreurs de crâne"). His personal notes showed however that he himself did not always believe in his purported war optimism, being at times close to defeatism. During the war Barrès also partly came back on the mistakes of his youth, by paying tribute to French Jews in Les familles spirituelles de la France, where he placed them as one of the four elements of the "national genius", alongside Traditionalists, Protestants and Socialists – thus opposing himself to Maurras who saw in them the "four confederate states" of "Anti-France". After World War I, Barrès was involved with irredentist forces in Luxembourg, and sought to increase French influence in the Rhineland. On 24 June 1920, the National Assembly adopted his draft aiming to establish a national day in remembrance of Joan of Arc. Barrès is considered, alongside Charles Maurras, as one of the main thinkers of ethnic nationalism at the turn of the century in France, associated with Revanchism — the desire to reconquer the Alsace-Lorraine, annexed by the newly created German Empire at the end of the 1871 Franco-Prussian War (Barrès was aged 8 at that time). In fact, he himself popularised the word "nationalism" in French. This has been noted by Zeev Sternhell, Michel Winock (who titled the first part of his book, Le Siècle des intellectuels, "Les Années Barrès" ("The Barrès' Years"), followed by Les Années André Gide and Les Années Jean-Paul Sartre), Pierre-André Taguieff, etc. He shared as common points with Paul Bourget his disdain for utilitarianism and liberalism. Opposed to Jean-Jacques Rousseau's theory of social contract, Barrès considered the 'Nation' (which he used to replace the 'People') as already historically founded: it did not need a "general will" to establish itself, thus also contrasting with Ernest Renan's definition of the Nation. Much closer to Herder and Fichte than to Renan in his definition of the Nation, Barrès opposed French centralism (as did Maurras), as he considered the Nation to be a multiplicity of local allegiances, first to the family, the village, the region, and ultimately to the nation-state. Influenced by Edmund Burke, Frédéric Le Play and Hippolyte Taine, he developed an organicist conception of the Nation which contrasted with the universalism of the 1789 Declaration of the Rights of Man and of the Citizen. According to Barrès, the People is not founded by an act of autonomy, but find its origins in the earth (le sol), history (institutions, life and material conditions) and traditions and inheritance ("the dead"). His early individualism was quickly superated by an organicist theory of the social link, in which "the individual is nothing, society is everything"). Barrès feared miscegenation of modern times, represented by Paris, claiming against Michelet that it jeopardised the unity of the Nation. The Nation was to be balanced between various local nationalities (he spoke of the "Lorraine nationality" as much as of the "French nationality") through decentralisation and the call for a leader, giving a Bonapartist aspect to his thought which explained his attraction for the General Boulanger and his opposition to liberal democracy. He pleaded for a direct democracy and personalisation of power, as well as for the implementation of popular referendums as done in Switzerland. In this nationalist frame, anti-Semitism was to be the cohesive factor for a right-wing mass movement. The Dadaists organised in spring 1921 the trial of Barrès, charged with an "attack on the security of the mind" ("attentat à la sûreté de l'esprit") and sentenced him to 20 years of forced labour. This fictitious trial also marked the dissolution of Dada - its founders, among whom was Tristan Tzara, refusing any form of justice even if organised by Dada. Barrès died in Neuilly-sur-Seine on 4 December 1923. The Undying Spirit of France, Yale University Press, 1917. "Young Soldiers of France." In The War and the Spirit of Youth, Atlantic Monthly Company, 1917. Colette Baudoche: The Story of a Young Girl of Metz, George H. Doran Company, 1918. "Officers and Gentlemen," The Atlantic Monthly, Vol. CXXI, 1918. The Faith of France, Houghton Mifflin & Company, 1918. The Sacred Hill, The Macaulay Company, 1929. "Uprooted." In The World's Greatest Books, W. H. Wise & Co., 1941. Massia Bibikoff, Our Indians at Marseilles, with an Introduction by Maurice Barrès, Smith, Elder and Company, 1915. Georges Lafond, Covered with Mud and Glory, with a Preface by Maurice Barrès, Small, Maynard & Company, 1918. "The individual is nothing, society is everything" (L'individu n'est rien, la société est tout). "Reality, it cannot be repeated too often, varies with every one of us." "There is no reality for me but pure thought. Minds alone are interesting." "A strange rage this modern mania to give a common manner to all minds and to destroy individuality." "Young men in meetings put in common nothing but their mediocrity." "What distinguishes an argument from a play upon words, is that the latter cannot be translated." ↑ "Maurice Barres and His Books," The Living Age, 25 November 1922. 1 2 3 Eugen Weber (1962). "Nationalism, Socialism and National-Socialism in France". French Historical Studies. 2 (3): 273–307. doi:10.2307/285883. JSTOR 285883. ↑ Les Déracinés (Roman de l'énergie nationale I), in Romans et voyages, R. Laffont Bouquins, 1994, p. 615. ↑ Pène du Bois, Henri (1897). Witty, Wise and Wicked Maxims. New York: Brentano's, p. 88. ↑ Pène du Bois (1897), p. 96. ↑ Pène du Bois (1897), p. 97. ↑ Pène du Bois (1897), p. 99. ↑ Pène du Bois (1897), p. 101. Bourne, Randolph S. (1914). "Maurice Barres and the Youth of France," The Atlantic Monthly, Vol. CXIV, No. 3, pp. 394–399. Bregy, Katherine (1927). "Mysteries and Maurice Barrès," Commonweal, p. 468. Cabeen, D.C. (1929). "Maurice Barrès and the 'Young' Reviews," Modern Language Notes, Vol. 44, No. 8, pp. 532–537. Cheydleur, F.D. (1926). "Maurice Barres: Author and Patriot," The North American Review, Vol. CCXXIII, No. 830, pp. 150–156. Clyne, Anthony (1920). "Maurice Barrès," The Contemporary Review, Vol. CXVII, pp. 682–688. Curtis, Michael (1959). Three Against the Third Republic: Sorel, Barrès and Maurras. Transaction Publishers. Eccles, F.Y. (1908). "Maurice Barrès," The Dublin Review, Vol. CXLIII, No. 286, pp. 244–263. Doty, C. Stewart (1976). From Cultural Rebellion to Counterrevolution: The Politics of Maurice Barrès. Ohio University Press. Evans, Silvan (1962). Eastern Bastion: The Life and Works of Maurice Barrès: A Short Centenary Study. Ilfracombe: A.H. Stockwell. Fleming, Thomas (2011). "Colette Baudoche by Maurice Barrès," Chronicles Magazine. Gide, André (1959). "The Barrès Problem." In: Pretexts: Reflections on Literature and Morality. New York: Meridan Books, pp. 74–90. Gosse, Edmund (1914). "M. Maurice Barrès." In: French Profiles. New York: Charles Scribner's Sons, pp. 287–295. Greaves, Anthony A. (1978). Maurice Barrès. Boston: Twayne Publishers. Grover, M. (1969). "The Inheritors of Maurice Barrès," The Modern Language Review, Vol. 64, No. 3, pp. 529–545. Guérard, Albert Léon (1916). "Maurice Barrés." In: Five Masters of French Romance. London: T. Fisher Unwin, pp. 216–248. Huneker, James (1909). "The Evolution of an Egoist: Maurice Barrès." In: Egoists: A Book of Supermen. New York: Charles Scribner's Sons, pp. 207–235. Hutchinson, Hilary (1994). "Gide and Barrès: Fifty Years of Protest," The Modern Language Review, Vol. 89, No. 4, pp. 856–864. Maloney, Wendi A. (1988). Maurice Barrès and the Cult of Adolescence. University of Wisconsin-Madison. Ouston, Philip (1974). The Imagination of Maurice Barrès. University of Toronto Press. Perry, Catherine (1998). "Reconfiguring Wagner's Tristan: Political Aesthetics in the Works of Maurice Barrès," French Forum, Vol. 23, No. 3, pp. 317–335. Robinson, Agnes Mary Frances (1919). "Maurice Barrès." In: Twentieth Century French Writers. London: W. Collins Sons & Co., pp. 1–33. Scheifley, William H. (1924). "Maurice Barrès," The Sewanee Review, Vol. 32, No. 4, pp. 464–473. Sergeant, Elizabeth Shepley (1914). "Maurice Barrès," The New Republic, Vol. I, No. 6, p. 26. Stephens, Winifred (1908). "Maurice Barrès, 1862." In: French Novelists of Today. London: John Lane, The Bodley Head, pp. 179–220. Souday, Paul (1924). "Maurice Barrès," The Living Age, Vol. CCCXX, No. 4153, pp. 269–271. Soucy, Robert (1963). The Image of the Hero in the Works of Maurice Barrès and Pierre Drieu la Rochelle. University of Wisconsin-Madison. Soucy, Robert (1967). "Barrès and Fascism", French Historical Studies, Vol. 5, No. 1, pp. 67–97. Stephens, Winifred (1919). The France I Know. New York: E.P. Dutton & Company. Thorold, Algar (1916). "The Ideas of Maurice Barrès," The Edinburgh Review, Vol. CCXXIII, No. 455, pp. 83–99. Trevor Field (1982). Maurice Barrès. London: Grant & Cutler, Ltd.
Turquet-Milnes, G. (1921). "Maurice Barrès." In: Some Modern French Writers. New York: Robert M. McBride & Company, pp. 79–106. Shenton, Gordon (1979). The Fictions of the Self: The Early Works of Maurice Barrès. U.N.C. Department of Romance Languages. Soucy, Robert (1972). Fascism in France: The Case of Maurice Barrès. University of California Press. Sternhell, Zeev (1971). "Barres et la Gauche: Du Boulangisme a "la Cocarde" (1889–1895)", Le Mouvement Social, Vol. 95, pp. 77–130. Sternhell, Zeev (1973). "National Socialism and Antisemitism: The Case of Maurice Barrès," Journal of Contemporary History, Vol. 8, No. 4, pp. 47–66. Suleiman, Susan Rubin (1980). "The Structure of Confrontation: Nizan, Barrès, Malraux," MLN, Vol. 95, No. 4, 938–967. Virtanen, Reino (1947). "Barrès and Pascal," PMLA, Vol. 62, No. 3, pp. 802–823. Weber, Eugen (1975). "Inheritance and Dilettantism: the Politics of Maurice Barrès," Historical Reflections/Réflexions Historiques, Vol. 2, No. 1, pp. 109–131. René Jacquet (1900). Notre Maître Maurice Barrès, Librairie Nilsson. J. Ernest Charles (1907). La Carrière de Maurice Barrès, Académicien, E. Sansot & Cie.
René Gillouin (1907). Maurice Barrès, E. Sansot & Cie.
Henri Massis (1909). La Pensée de Maurice Barrès, Mercure de France. Nicolas Beauduin (1910). "L'Evolution de Maurice Barrès," Quelques Uns, No. 1. Jean Herluison (1911). Maurice Barrès et le Problème de l'Ordre, Nouvelle Librairie Nationale. Jacques Jary (1912). Essai sur l'Art et la Psychologie de Maurice Barrès, Emile-Paul. Paul Bourget (1924). La Leçon de Barrès, À la Cité des Livres. François Mauriac (1945). La Rencontre avec Barrès, La Table Ronde. Albert Garreau (1945). 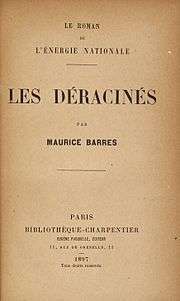 Barrès, Défenseur de la Civilisation, Éditions des Loisirs. Sarah Vajda (2000). Maurice Barrès, Flammarion. Wikisource has the text of the 1911 Encyclopædia Britannica article Barrès, Maurice. Wikimedia Commons has media related to Maurice Barrès.